Thanks to the kind of marketing meetings that consider alternative ideas such as “Panda snails”, the bio-engineered “Piranha Sharks”, retailing for $19.95 apiece, are the number one Christmas gift in the world of this witty New York City-set monster flick. Unfortunately, they reproduce rapidly, and adapt out of the water, which means alarmist accounts around the city of Dads having their pinkies bitten off and devoured pet cats. Although relatively light on creature feature action until the final third, this spry, endearing picture has a pleasing lightness of touch and some genuinely funny set pieces: one highlight involves an unbalanced Iraq veteran kidnapping the CEO of the Piranha Shark company with the intent to torture her...but he’s poorly prepared and leaves her making small talk with his chirpy wife while he slopes off to buy some waterboarding utensils. Another key dramatic moment relies on urgent information from a woman with Tourettes and a guy with extreme people-phobia. 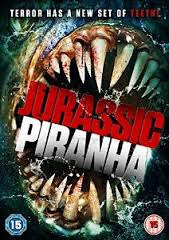 It’s consistently amusing, and refreshingly avoids the self-conscious broadness of the now-over-familiar SHARKNADO school of low-rent monster movies. Kevin Sorbo is a particular hoot as a corrupt Mayor who rarely has his trousers on and faces a very slight overreaction from the U.S. government (“You’re gonna nuke Manhattan? !”).